People responsible for a learning culture have to establish relationships across the organization built on trust. You must keep it fresh -- do things to get people excited about our own internal learning opportunities. Workplace learning isn’t a one-time event that you can launch and then move onto other things. Like most worthwhile initiatives, it requires ongoing care and maintenance if it’s going to provide lasting value. To make this happen and ensure your learning culture remains vibrant and doesn’t slide into passivity, you’ve got to be proactive and engaged. Here are a few ways to do just that. Relationships, too, require ongoing investment, so be sure to check in with people regularly. Don’t wait for them to come to you with requests, challenges, or suggestions. As the leader of my organization’s learning and development team, I am in service to the organization. Once a culture of self-directed learning is rolled out, an organization cannot simply assume everyone is getting what they need. Stay visible and connected as a trusted resource for anything related to learning and development. Of course, the learning content itself needs to be current so employees have access to helpful resources in the moment of need. But you also need to keep interest fresh among employees—what we call “thinking like a marketer.” And what do marketers do to stay top of mind among their target audiences? They run campaigns, they communicate news and updates, and they constantly keep a pulse of what’s important to their customers. 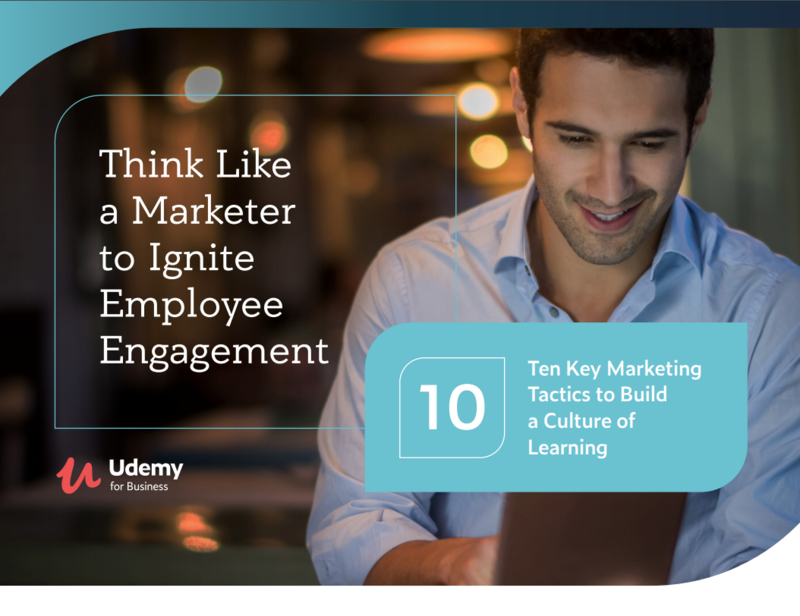 At Udemy, even though lifelong learning is the essence of our mission statement, we still do things to get people excited about our own internal learning opportunities. For example, every month we host DEAL hour (Drop Everything and Learn). It’s a great demonstration of how powerful learning is when everyone’s doing it. Employees also talk about the Udemy courses they’re taking in a Slack channel, too, which motivates others to check out those courses and follow their own interests. There are always people in the organization everyone else goes to for answers, whether it’s where to find certain information or how to perform a specific task. These natural “explainers” are such a valuable resource for your learning programs. They can spread your message about the importance of learning and encourage their teammates to pursue further knowledge. Your explainers probably relish their role as “teachers” to their colleagues, so take advantage of that enthusiasm and reward them for it. With their involvement, you can formalize mentorships and coaching relationships. They can lead study groups or hold office hours. Oftentimes, as we know from talking to so many instructors in our marketplace, helping others gain skills and reach goals is rewarding in and of itself. Still, calling explainers out for special recognition is a simple way to show the company’s true commitment to a learning culture. Consider offering them gift cards, themed t-shirts or other swag, maybe even extra paid time off. When discussing hiring practices, the idea of “culture fit” comes up a lot, but it’s a hard concept to define. I prefer to look for “culture adds,” i.e., people with qualities that will reinforce the best elements of our culture and bring renewed energy to it. In a learning culture, that obviously means seeking out talent who embrace lifelong learning. So, how do you spot eager, adaptable learners? For starters, don’t get hung up on traditional signals of educational achievement. Completing four years of university, while a big accomplishment, isn’t necessarily an indicator of someone’s attitude toward lifelong learning. I think we’ve all run across people who attended elite schools but aren’t motivated to continue growing their skill set. On the flip side, I’ve worked with lots of people who were disengaged school students but love learning when it’s related to their personal passions and career goals. Ask probing questions in interviews to understand a candidate’s real competencies and how they feel about continual upskilling, not just what they’ve worked on in the past or what’s listed on their resume. Talk to them about the role of learning in your organization and listen to what they do (or don’t) say about how they’ve kept their skills up to date. Finally, use the onboarding process to explain what’s expected of employees in a learning culture, so they are excited to participate from day one. Learning at work needs to be flexible to keep up in times of change. The best way to stay ahead of the curve is to supplement an actively managed learning platform, where employees can always find the latest must-have skills, with open communication channels, trusting relationships, and a culture built on the shared appreciation of continuous learning.